Normally I just ignore these idiots, but the other night I decided to take a moment to armory this player so I could evaluate the source of this rude generalization. It’s not like this guy did nothing to try and help us win…he assaulted two bases (although I’m not sure how commendable that is when you play a stealth class) – and bless his heart…he did do a lil’ bit of damage. I mean… he could have maybe just been one of those highly skilled, undergeared, overachieving experienced PvP’ers. That’s the sort of player you might expect would berate their entire team, considering their less than stellar contribution to the BG effort. …Not a guy wearing ilvl 375 gear, with 4k resilience and playing what’s arguably the most overpowered DPS class in PvP at the moment, i.e., Feral Druid. …Not someone with a personal best 1,634 arena rating, with a whopping 849 matches under their belt. Did I mention this guy plays Feral Druid..? 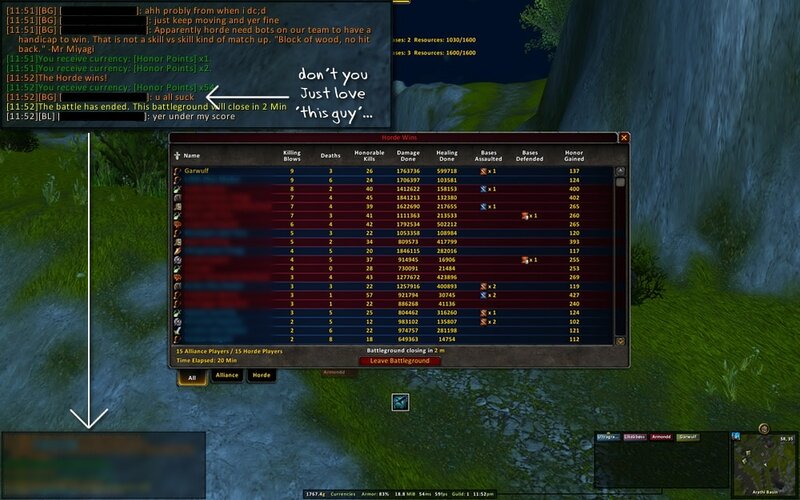 …Not a player who’s group queueing with an arena teammate, along with another player from his server. In case you’re wondering, there was nothing ever said directly to me, nor do I know this player. It’s not like I have a vendetta against this particular person — I’m just really fed up with this guy. Seriously people… I don’t care how good you think you are, don’t be this guy. No one likes this guy. Any of you ever encounter this guy before..?